The most recent example stems from the study that was just released on whether mobile phones cause brain cancer. The study’s official outcome was that it was inconclusive, however, this didn’t stop the scare mongers in the media getting hold of it and manipulating it their way. According to them, there’s an increase in the chances of getting brain cancer of 50% if you are a heavy user of a mobile phone. Now lets just dissect that statement, shall we? A quick search of the net found that 2 out of every 100,000 people get brain cancer. A 50% increased risk puts that figure at 3 in 100,000. When you say it like that, it seems completely irrelevant. 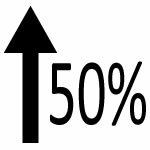 The vast majority of people think that a 50% increased chance means a 50% chance. Of course, the media and politicians use this kind of language because people don’t know any better. It is in this way they are able to push their own agenda while people think they are doing the right thing. Just think about how many times someone has told you there is an increased chance for something, then you’ll realise how many times you’ve been mislead.